About Fiona Danks (Author) : Fiona Danks is a published author of children's books. 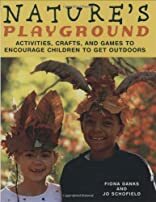 A published credit of Fiona Danks is Nature's Playground: Activities, Crafts, and Games to Encourage Children to Get Outdoors. About Jo Schofield (Author) : Jo Schofield is a published author of children's books. A published credit of Jo Schofield is Nature's Playground: Activities, Crafts, and Games to Encourage Children to Get Outdoors.